Development of a homogenous nonlinear spring model characterizing the interfacial adhesion properties of graphene with surface defects. In graphene-based systems, the interface between graphene and other materials creates a mechanically weak region. Therefore, understanding the mechanical behaviour of graphene interfaces is critically important in designing reliable graphene-based systems. On the other hand, defects such as surface impurities are unavoidable during the fabrication of nanoscale systems. We developed a nonlinear spring model to characterize the influence of surface defects on the adhesion properties of graphene interfaces. 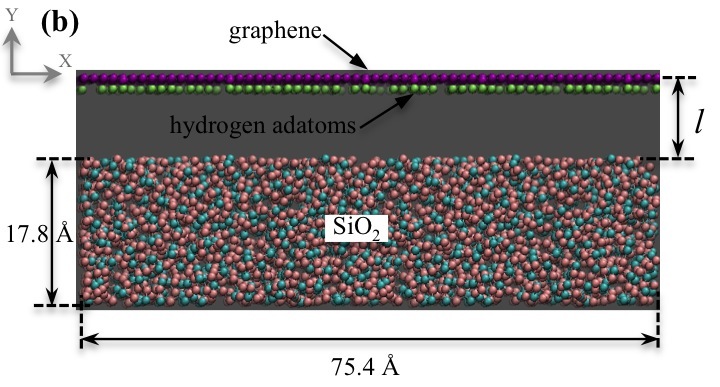 The model was extensively validated using molecular dynamics simulations for graphene–silicon dioxide interface, and the computed cohesive energy is also in agreement with the recently measured energies. Our results indicate that low concentrations of hydrogen adatoms highly degrade the interfacial strength, whereas vacancies have a negligible effect on the interfacial strength. We also compared the influence of hydrogen adatoms on the properties of several commonly encountered graphene interfaces. In addition, we developed a novel analytical framework to compute the required graphene-substrate interfacial area to withstand an applied force during the indentation test. These findings are useful in designing graphene-based nanoelectromechanical systems and composite materials. More importantly, the developed spring model can be parameterized to investigate the mechanical behaviour of any material interface, which is vitally important in designing reliable nanodevices and nanocomposites.